Climate advocates might have missed this one in the midst of election chaos. Just days after millions of Americans decided on candidates and ballot initiatives, the Union of Concerned Scientists (UCS) made a pretty important decision of its own, choosing to release a report on nuclear energy that was likely to ruffle some feathers in the environmental community. Like several other mainstream environmental organizations, UCS has long been skeptical about the benefits vs. costs of nuclear energy. But, after analyzing the potential loss of America’s unprofitable nuclear plants and the damage this would do to climate efforts, UCS was unequivocal in its report—it defended the vital role of nuclear power plants in cutting emissions and called for policy action to protect them. Coming from an environmental NGO as respected and intellectually rigorous as UCS, this report is a big deal and definitely worth a read. There are also a few things you should keep in mind to put this momentous report in context. 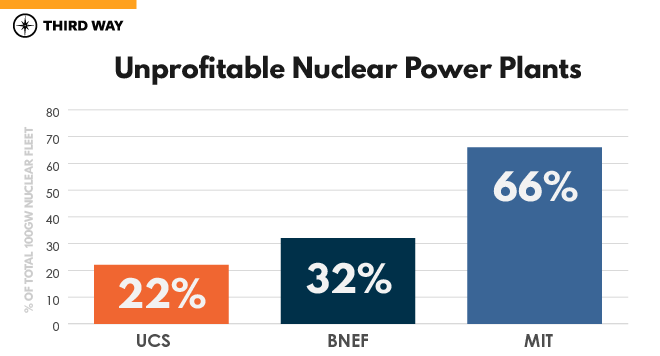 The UCS report found that 22.7 GW, or 22% of the US’s total nuclear capacity, will become unprofitable between 2018 and 2022 and could retire as a result. Even worse, the report finds that fossil fuels like natural gas and even coal would take up most of the slack if these carbon-free resources went offline. In the UCS’s early retirement scenarios, the resulting increase in emissions from the power sector ranges between 4-6% by 2035. That’s a big step in the wrong direction, since we’re supposed to be eliminating power sector emissions ASAP to fight climate change. Losing 22% of the nuclear fleet would essentially “undo” all of the gains America has made in wind and solar for the past five years combined! Even if we were able to replace carbon-free nuclear with other carbon-free resources like renewables, which is highly unlikely in the near-term, that doesn’t really help our situation. Cutting carbon from the power sector requires us to rapidly increase the total amount of clean energy generation on the grid. In that sense, using renewables to pay the debt for retired nuclear is a huge waste of carbon-free resources. Just how big of a waste? Losing 22% of the nuclear fleet (roughly 179,000 GWh of electricity per year) would essentially “undo” all of the gains America has made in wind and solar for the past five years combined! Figure 1: Generation from wind and large-scale solar built in each year compared to the equivalent generation lost from the early retirement of 22% of nuclear power capacity. While the reference case shows 22% of the US nuclear fleet will be unprofitable in the coming years, UCS’s report also includes scenarios showing up to 42% of the fleet at risk of closure, due to things like changes in the cost of nuclear and natural gas. When you compare the UCS report to other analyses, the outlook for nuclear power plants looks even grimmer. Bloomberg New Energy Finance estimates that 32% of the nuclear fleet will be unprofitable through 2021. And research from MIT suggests that around 66% of the nuclear fleet will become unprofitable from 2017 to 2019.1 As we said, losing 22% of the nuclear fleet would cost the US all the carbon-free gains we’ve made from wind and solar deployment over the past five years. That’s bad enough. But according to Third Way analysis, losing 66% of the fleet would wipe the carbon-free gains from the next 13 years of renewables growth. Figure 2: Percent of ~100GW nuclear fleet that will become unprofitable in the next 5 years or less. 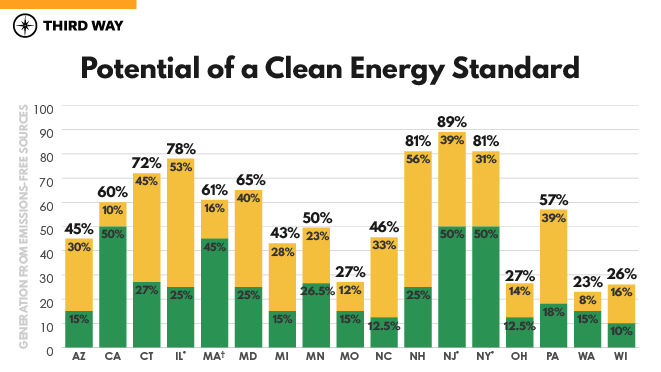 Third Way and the Breakthrough Institute took a close look at clean energy standards (CES) in particular, seeing as how 27 states and the District of Columbia already have similar standards that require renewable power, and over a dozen of them are considering how to get more out of these standards. Third Way found that 17 states could make sizeable increases in the amount of clean power required in the state, just by including their existing nuclear plants under a #CleanEnergyStandard. By expanding their renewable standard to a CES, we found that 17 states could make sizeable increases in the amount of clean power required in the state, just by including their existing nuclear plants. This would allow some unlikely states to suddenly become leaders in the race toward carbon-free power. And if portfolio standards included nuclear, it would ensure that these plants get replaced by other low-carbon sources when they eventually retire, eliminating the very serious risk that fossil fuels will pick up the slack. Figure 3: Potential of a Clean Energy Standard. Illinois, New Jersey, and New York each have crediting programs that support a large portion of their existing nuclear fleets, but none of the nuclear plants in these states are part of a portfolio standard. Massachusetts has a portfolio standard that calls for 80% clean energy by 2050, and allows new nuclear and other non-renewable, carbon-free sources to be eligible for the portion of the standard that exceeds the 45% RPS. In the face of climate change, we do not have the luxury of ignoring nuclear power as a valuable zero-carbon energy resource. The UCS report adds to the growing trend of research that highlights the dangers of letting our nuclear plants retire early, and the importance of choosing policies that take advantage of as many clean energy options as possible. In addition to UCS, climate leaders across the country are embracing a technology-neutral approach to fighting climate change, and that includes nuclear. States like New York, Illinois, New Jersey, and Connecticut have taken steps to support their at-risk nuclear plants. Massachusetts and California have recently enacted clean energy standards. The head of one of the world’s biggest climate-funding philanthropies has called on environmentalists to recognize nuclear’s value in the climate fight. The Nature Conservancy recently found that an increasing share of nuclear energy is vital towards decarbonizing the world’s energy use. And Google is leaving the door open for clean resources like advanced nuclear and carbon capture to help it secure carbon-free energy for its data centers, 24/7. The @UCSUSA report adds to the growing trend of research that highlights the dangers of letting our nuclear plants retire early, and the importance of choosing policies that take advantage of as many clean energy options as possible. It is time for environmentalists and climate change advocates to come together and focus on our overall goal – reducing our emissions as rapidly as possible. As UCS has demonstrated, a bold, ambitious, and science-based approach is the best way to get there. All of these studies, including the UCS study, assume a total operating capacity for all US reactors around 100GW. The UCS report models the impact of a national carbon price of $25 per ton of CO2 and a national low-carbon electricity standard (LCES) increasing from 45% in 2020, to 60% by 2030, and 80% by 2050. For example, the carbon price would more than triple the generation from wind and solar “from 10 percent of total US power generation in 2017 to 36 percent by 2035.” A LCES would result in even further growth in renewables to 41% by 2035.